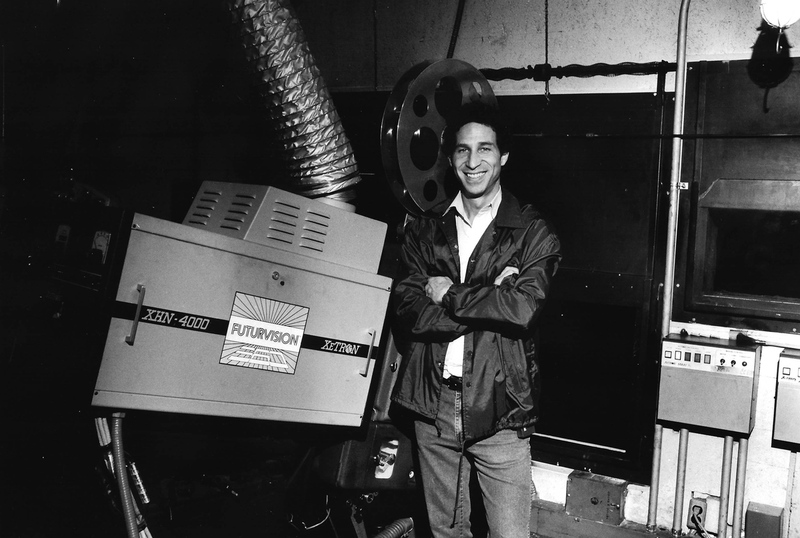 The purpose of this new and "state-of-the-art" film system is to provide the film going public with an experience in theatrical motion picture entertainment never before available. FuturVision-360 (TM) provides a wall-to-wall, floor-to-ceiling motion picture image, high definition in quality, and presented without strobing or jitter. The sound system is superior to conventional systems in that the sound encompasses 360 degrees to compliment the "FuturVision (TM)" picture. FuturVision-360 (TM) discrete 8 channel sound is the finest state-of-the-art system developed to date utilizing digital sound technology. The realization and perfecting of FuturVision-360 (TM) is the end result of more than three years research and development. FuturVision-360's (TM) technical breakthrough is in the design of a photographic and projection system. 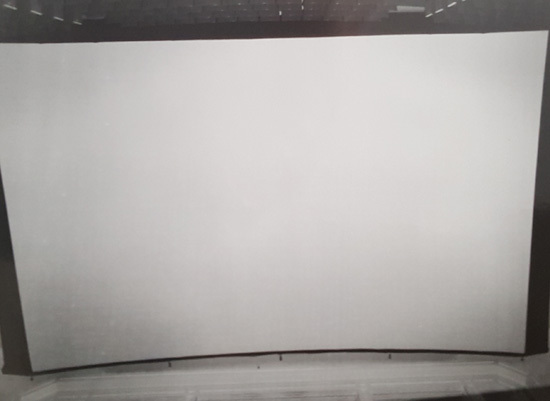 A special automated screen allows conventional theatres to accommodate the giant "FuturVision (TM)", while at the same time converting in a few minutes to conventional motion picture exhibition. The frame of FuturVision-360 (TM) has an aspect ratio of 1.466:1. This dynamic frame is different from all other current "wide screen" processes. Cinemascope and other popular wide screen systems create a ribbon format which is limited in the vertical field of view. In comparison, FuturVision (TM), by using an almost rectangular frame, provides the cinematographer greater flexibility in framing and revealing the action, vertical as well as horizontal peripheral view is photographed. To allow for maximum distribution of FuturVision-360 (TM) productions, a series of optical converters have been designed. With the use of the converters, conventional motion picture prints can be rendered. Release prints, 70mm, 35mm, 16mm and even Super 8 can be duplicated. The best suited formats would be the rectangular aspect ratio frames such as 35mm 1.35:1. Wide screen type prints of the ribbon format can also be made by cropping safety areas of the action, eliminating the height of the "FuturVision-360 (TM)" dynamic frame, but producing an acceptable and compatible "CinemaScope type" image. Unique to the FuturVision-360 (TM) process is a newly designed electronic telecine that transfers FuturVision-360 (TM) to the electronic media. FuturVision-360 (TM) will be the only system that converts to high definition video of 1125 lines utilizing its high definition dynamic frame concept with unequalled picture quality. 1. Single projection, single camera system. 2. Film format is standard 65mm for photography, and standard 70mm for projection. 3. The projector is a conventional 35/70mm universal unit with optical and magnetic sound capability. 4. Screen is automated with a gain perforated surface. 5. Sound is 8 track discrete digital sound or Dolby 6 track stripe. WHERE CAN FUTURVISION-360 (TM) MOTION PICTURES BE EXHIBITED? A FuturVision-360 (TM) film is to be experienced as an "event presentation". Due to its larger-than-life image, the FuturVision-360 (TM) theatre must contain certain physical characteristics. These characteristics can be found in already existing theatres that were at one time large film houses with both an orchestra and a balcony. These theatres have since been divided into two separate show units. The balcony or usual "show unit #2" is the ideal FuturVision-360 (TM) location. This is due to the following reasons: (1) high ceiling, and (2) contains a stadium type seating arrangement. Anamorphic compression techniques for creating wide screen motion picture presentations has been used commercially since 1953 as a practical means of producing a "wide horizontal field of view" picture image. These systems have gone under such trade names as "Cinemascope", "Panavision", "Vistascope", etc. In these anamorphic processes the picture is recorded on 35mm movie film with a two-times width compression in photography, and the same expansion ratio is used in projection. The camera lens sees a picture twice as wide as that seen by a conventional lens, but by compressing the image horizontally, the film does not have to be twice the normal width. In projection, an anamorphic lens spreads the picture and restores objects to their original shape. Another technique which creats a large film presentation is the use of wider film formats such as 70mm to create a wide screen effect with greater resolution and screen brightness. 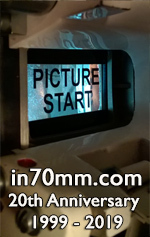 A film format known as "IMAX" uses not only the 70mm guage film, but records the information in a 15 perforation frame area with the film being transported horizontally rather than in the conventional vertical pulldown method. By doing this, the width of the frame is no longer restricted by the width of the motion picture film since the frame is recorded laterally. Systems like "IMAX" have been very successful. They are being marketed as "Expo" type presentations sponsored by major corporations, and housed in custom built environments such as The Smithsonian Museum in Washington. A major drawback of the "IMAX" system regarding its use in theatrical productions is that the film operates at a speed of 336 feet per minute versus the 112 1/2 foot rate of conventional 70mm film. This consumption of film is a prohibitive financial drawback considering the "shooting ratios" used in feature film production. In projection the "IMAX" system requires a custom made projector that uses a sophisticated "rolling loop" system to transport the 15 perf. 24 frame-per-second motion picture. It is the purpose of the FuturVision-360 (TM) process to achieve the experience of the large "IMAX" type format without the need of expensive special photographic and projection equipment. More importantly, FuturVision-360 (TM) can be exhibited in conventional motion picture theatres in all major marketplaces. In addition, to enhance the marketability of FuturVision-360 (TM), high definition 35mm and 70mm conventional motion picture prints can be made so as to maximize the revenue potential of films produced in the FuturVision-360 (TM) process on a world wide basis. The FuturVision-360 (TM) process utilizes a technique in the novel application of vertical, anamorphotic densification of a standard 5 perforation high, 70mm academy film aperature. By utilizing the 70mm format, which by its physical aspect ratio is wider than it is high, and introducing vertical densification, the "FuturVision-360 (TM)" dynamic frame system has reconstructed the format to approximately 3x4 or 1.466:1 rectangular frame. In using this technique, a comparable frame size and image vision can be created similar to that of "IMAX", but eliminating the need to use non-standard picture equipment and techniques, such as IMAX's 15 perforation horizontal format. To enhance the FuturVision-360 (TM) image, the film speed of the system operates at 30 frames-per-second rather than the conventional 24 frames-per-second. The purpose of this film speed is twofold:, (1) to improve the fidelity of the FuturVision-360 (TM) image by reducing flicker and visual abberations such as strobing, horizontal motion jitter, as well as reducing apparent grain in the image, and (2) compatibility with the new high-definition television technology by standardizing on the 30 frame rate of the television system. In this way the maximum quality transfer capabilities wil1 be achieved without the need of the 3-2 pulldown techniques to convert 24 frame motion pictures to 30 frame television, current and proposed high-definition systems. A unique FuturVision-360 (TM) conversion printer has been designed so that the 30 frame rate negative can be duplicated to a 24 frame sub master film if required. The 24 frame film will be created with the use of non-drop frame printing utilizing a computerized optical printer that will take the "6 extra frames" and integrate them into the 24 frame dupe film master so as to eliminate any image motion distortion or stutter in the conversion process. Because most theatres will require a FuturVision-360 (TM) screen, an innovative retractable system has been designed. 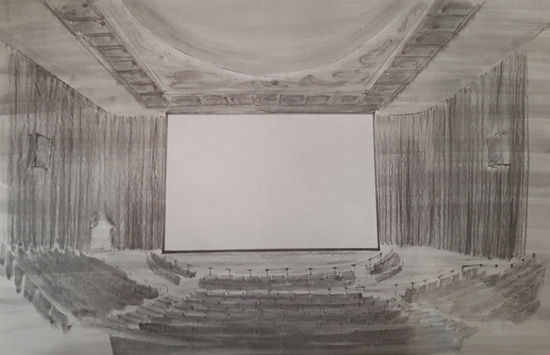 Where an already existing screen is situated beneath the proscenium arch of a balcony theatre, a secondary screen is located in front of the existing overhead arch. This is to clear the limits of the physical characteristics of the proscenium, and to take advantage ot the full height of the auditorium. The FutureVision-360 (TM) screen is erected automatically by a series of motorized cables located in the ceiling of the auditorium. An electric system lifts the FuturVision-360 (TM) screen to the limits of the theatre height. Within minutes the screen is fully extended for a FuturVision-360 (TM) presentation. 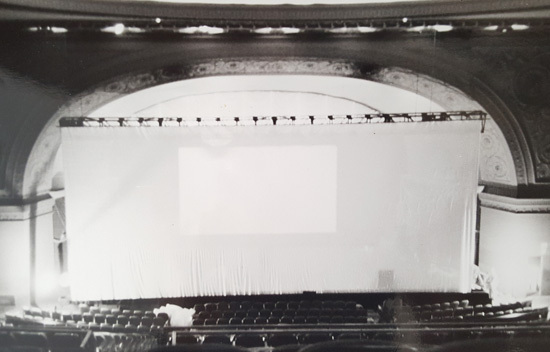 The screen is housed, when not in use, in a pit located on the floor of the theatre. 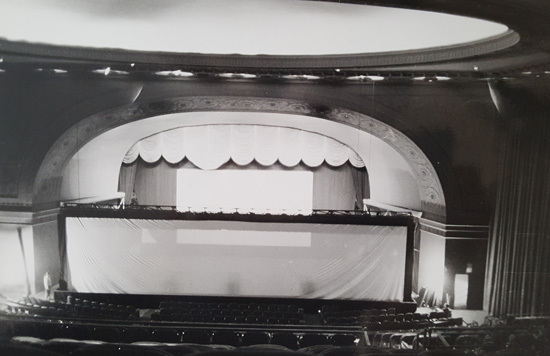 When the screen is lifted to the ceiling, it is pulled taut, utilizing a top and bottom rigid tubed frame, stretched out at the sides with the support of a chainlike guide on the sides of the sound screen. When a FuturVision-360 (TM) presentation is completed, the screen is retracted into its plenem pit, and the lowering of the FuturVision-360 (TM) screen is accomplished. Because the chain link folds in sympathy with the screen into the plenem, the plenem need only be large enough to allow the screen to fold in an accordion effect to an area of approximately 2 1/2 feet wide by 3 feet deep. The FuturVision-360 (TM) camera is a standard 65mm, 5-perf motion picture system. The camera contains not only the film transport, but also provides for reflex viewing, video assist, sound as well as variable speed, "DATAKODE" time recording, and a bayonet lens mount for the different focal length FuturVision-360 (TM) lenses. The FuturVision-360 (TM) lenses vary in focal length from 30mm to 300mm, as well as zoom. The FuturVision-360 (TM) process takes advantage of all photographic techniques available in today's cinematographic industry including hand held and high speed slow motion effects. The knowledgable cinematographer can use the FuturVision-360 (TM) camera without any special training. The visual impact and potential of the FuturVision-360 (TM) photographic system is limitless, creating a whole new experience in film entertainment. Video assist, action confidence, screening of dailies and post production editing are expedited through the use of an electronic viewfinder integrated into the film camera viewfinder. 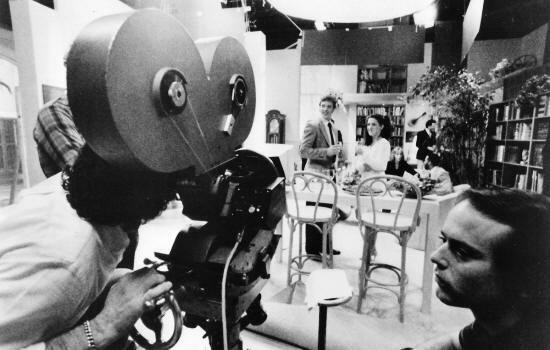 The electronic video system operates at the same rate as the FuturVision-360 (TM) cameras, 30 frames-per-second, including the videotape recorder receiving the output of the video assist. Utilizing Eastman "DataKode" treated color negative film, a common frame code is placed on both the FuturVision-360 (TM) videotape and the FuturVision-360 (TM) camera film negative during photography. At the end of a production day the FuturVision-360 (TM) film is forwarded to the lab for processing and storage. The FuturVision-360 (TM) videotape is then set up on a standard video editing system. The Director, Cinematographer and Editor can immediately view all takes, and if desired, assemble the "buy footage" into a rough cut. This technique is extremely valuable when far away location work is concerned, eliminating time and expense waiting for film dailies from the lab. For the balance ot the post production and negative assembly, the frame code from the FuturVision-360 (TM) electronic dailies is used to provide the negative cutters with the proper assembly information as to the final cutting of the DataKode FuturVision-360 (TM) film negative. 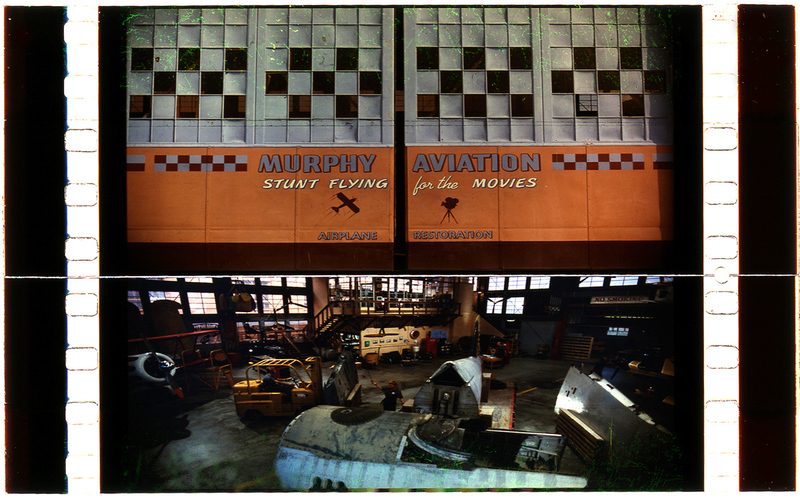 Post production techniques of FuturVision-360 (TM) are accomplished in the same manner as conventional film processes. A 35mm reduction print is made from the 65mm FuturVision-360 (TM) camera original. The synchronization between the picture head (at 30 frames-per-second) and the sound track (at 24 frames-per-second) is accomplished by a simple modification of the pullygear arrangement on a standard editing console. Because the sound system operates at 24 frames-per-second, all sound post production is easily accommodated by any conventional audio mixing facility. In a sound mixing facility, picture and sound are also easily adapted for the FuturVision-360 (TM) process by a similar adaption. An optical printer, capable of using the 65mm film format can produce most of the needed visual effects using a high quality spherical lens. Fades, dissolves, wipes, etc. are achieved with this spherical lens system. For miniature photography, the Futurvision-360 (TM) anamorphotic lenses can be used, except for extreme closeup work or where ultra depth of field is to be achieved. For this purpose a special effects FuturVision-360 (TM) camera has been developed. This special camera transports the film at an 8 perforation frame rate using spherical lenses. All optical work is done in this manner with a 65mm printer, also transporting at the same 8 perforation rate. When compositing of the effects is to be made, a FuturVision-360 (TM) anamorphotic camera head is used producing a composite 5 perf. FuturVision-360 (TM) negative which is then cut into the production camera original. 8 - channel FuturVision digital 360 surround sound playback system. Was used also for 35mm features such as Warner Bros. "Home Of The Brave" staring Laurie Anderson music concert. 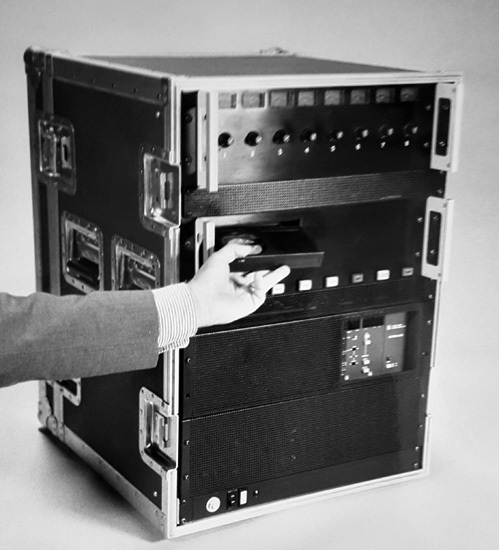 The FuturVision-360 (TM) 8 track digital replicator is a major breakthrough in motion picture sound reproduction. With a 80-90 DB dynamic range the system creates life like audio, superior to current 6 track cinema sound. The digital sound does not have to be played loud to be enjoyed, the detail of the reproduction is outstanding. The FuturVision-360 (TM) digital replicator is a low cost double system component and slaves to the film, synchronizing electronically. The sound track is no larger then a home video cassette and can play for more then three hours. The replicator is completely automated and a proven technique. For optimum results all original location recording should be digitally recorded, as well as the music elements. Many recent motion pictures have been recorded digitally, but reproduced in an analog format. For the first time, the true fidelity of digital sound can be part of the motion picture experience. In the event that it is desirable to exhibit in 6 track, the 70mm film can contain a composite conventional Dolby track. Because FuturVision-360 (TM) is a unique film process, the application of the system for corporate sponsored productions is readily feasible. This lucrative motion picture market can include FuturVision-360 (TM) "Road Shows", in which the system, including screen, sound system, projection hardware and tents can travel from location to location. 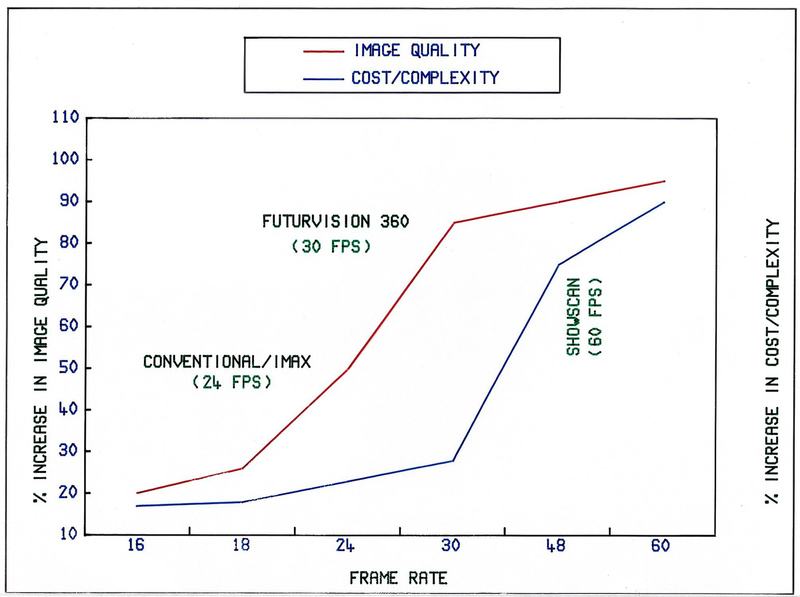 FuturVision-360 (TM) has developed a unique concentrator anamorphotic printer lens that converts "IMAX" film to the FuturVision-360 (TM) system. This system will allow corporate owners of "IMAX" productions, currently limited to the presentation of their productions due to the prohibitive costs of "IMAX" exhibition, a secondary market utilizing FuturVision-360 (TM) on its own large screen. This will allow a more financially practical means of exhibition in this new market place. It is a primary marketing goal that new corporate productions be originally photographed in FuturVision-36O (TM), as well as presented in this process. However, to enhance the initial introduction of this system, "IMAX" to FuturVision-360 (TM) conversions will be an immediate source of revenue. 20 minute conversion from conventional to FuturVision 360. Loew's State 2 converted to Futurvision.